The number of tourists who come to taste Turkish dishes has increased in recent years, according to Gökhan Tufan, the chairman of All Cooks and Confectioners Confederation (TAŞPAKO). Tufan said that number would increase further with Turkey's southeast cities of Gaziantep and Hatay becoming "UNESCO Creative Cities of Gastronomy." It is very important to promote the Turkish cuisine globally, Tufan said, stressing that gastronomy is very popular in the world and that it attracts great interest. Tufan noted that food culture tourism is growing, and that cuisine has been adopted in terms of promoting countries and economies. He recalled that, especially in the last five years, there has been a visible increase in the number of tourists coming to Turkey for Turkish cuisine. "Even more important is that the Ministry of Culture and Tourism attaches importance to gastronomy. The preparation of a commission on gastronomy in the 3rd Tourism Council recently held in Ankara is an indication of the importance our government puts on this issue and how important it is to the 2023 targets," he said. "Turkish cuisine deserves it too. The only thing missing in the global sense is related to publicity. I hope we will overcome this as well." Tufan said that food tourism was better and more efficient than the previous year according to information received from associations in tourist regions in particular. Pointing out that there is a cuisine-related trend that is on the rise every day, he said Turkish cuisine must be promoted properly in the global sense. 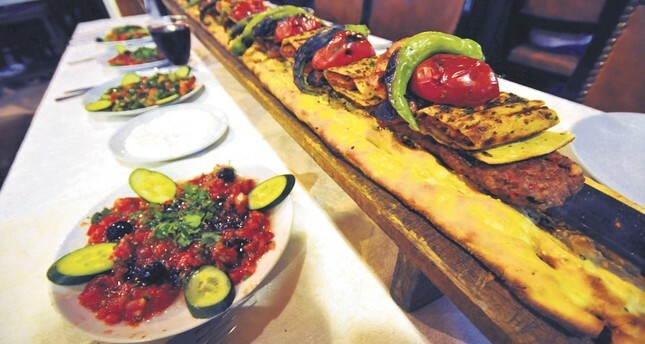 "We need to ensure that people really come to Turkey to eat these dishes. Our government has made serious moves in relation to this issue," he added. The chairman said tourists coming from abroad enjoy Turkish cuisine. He highlighted that with its spices and delicacies and in light of the civilizations hosted by Anatolia from past to present, Turkish cuisine has really great value and richness. "When we look at the 81 provinces, we can talk about tens of thousands of products. In this respect, tourists coming to the country quite enjoy our dishes," he said, suggesting that Turkish dishes are actually more appealing to the Middle East and the Mediterranean since Turkey has values that coincide with the cuisines of those countries. "In particular, people who come from Europe, Russia and the Far East enjoy our different kebab varieties, pot dishes, appetizers, cereals and beans. We obtain this data by talking to these people personally," he said. The TAŞPAKO chairman indicated that baklava, döner and kebab are known as Turkish dishes in Europe, adding that apart from these, Turkey has many different products like tens of thousands of sour and sweet dishes, very different pastries, meat, pots, stew dishes, dough and milk-based desserts. "It is time to introduce them now. Municipalities and governor's offices in many provinces have begun to give importance to these issues," he said. "Now that we have begun to take ownership of Turkish cuisine as a nation, the country's gastronomy and food are starting to be discussed on TV and in newspapers." More than 30 million foreign nationals entered Turkey in the first 11 months of 2017, according to data compiled by Turkey's migration authority, the Migration Management Directorate General, on Saturday. A total of 30.37 million foreign nationals entered Turkey, while 30.4 million left the country during the same time, according to the data. In 2016, 24.7 million foreign nationals visited Turkey, and in the first 11 months of this year this figure rose more than 5 million. Russians were the number one nationality visiting Turkey, followed by Germans and Iranians. In October, the governor of Turkey's Mediterranean province of Antalya said that Russian tourists visiting the city hit an all-time high, reaching 3.4 million by the end of September.